As a summer camp director I am amazed how many children show up to camp with their cellphones, iPods, gaming devices and the like. They are so into connecting online that they are willing to give up real life experiences with their face in their phone, texting away. For that very reason we have a no electronics policy at our camp. Throughout the school year our children can be overscheduled, stressed out and plugged in to some or multiple electronic devices. It is pretty unavoidable; between iTouches, iPads, computers, video games and TV, kids spend a good amount of their day “plugged in”. When you give your child the gift of sending them to overnight camp, they grow in so many ways, and unplugging them for that time is priceless. Interacting personally with peers and staff, connecting with the incredible water and nature, encouraging self-discovery and skill development, are all the rewards of unplugging at Maine camps. 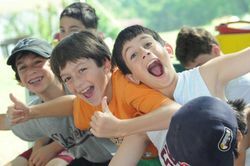 To find out more about all the amazing overnight camps in Maine, please visit Maine Camp Experience and start planning the best summers of your children’s lives now!